BYU expresses thanks to those who build the university of tomorrow with deferred gifts today. The true story of Alfred Kelly, ’13, has reached legend status at BYU. It is portrayed in a mural in the Cougareat, it has been depicted on stage, and it is frequently retold by professors, university presidents, students, and writers. But when we relate this powerful story, we often end it prematurely. We usually mention that in 1913 BYU’s financial burdens prompted a plan for the school to sell much of Temple Hill as housing lots. We explain student Alfred Kelly’s assignment to encourage the sale at an alumni banquet in Room D of the Academy Building, and we describe his early-morning vision of Temple Hill filled with students and “temples of learning.” We also indicate that Kelly’s courageous telling of his vision—instead of the assigned sales pitch—saved BYU’s present-day campus from becoming a neighborhood. A society appropriately named for Jesse and Amanda Kknight acknowledges and thanks those who have helped secure BYU’s future through deferred gifts. Photo by Seth Smoot. What we often don’t dwell on is the man who rose to his feet at the end of the meeting and pledged a large donation so the school wouldn’t have to sell Temple Hill. That man was Jesse Knight, a wealthy miner and a trustee of the university, whose generosity to the school had begun in the late 1890s. After Brigham Young Academy’s primary benefactor, Abraham O. Smoot, passed away, Jesse and his wife, Amanda, stepped into the role. They donated much of the land that later became BYU campus, contributed half of the money to build the Maeser Building, and established scholarships. A century later, in September 2003, BYU’s new president expressed thanks to the Knights. “Brigham Young Academy became a university on Oct. 23, 1903,” said President Cecil O. Samuelson in the same room where Kelly gave his speech, now part of Provo’s library, “which means that in just a few weeks we will mark the centennial anniversary of Brigham Young University. That would not even be possible without the foresight and sacrifice and courage of Jesse and Amanda Knight. 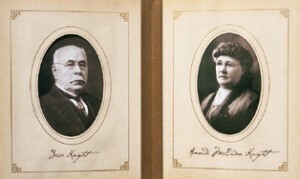 The occasion was the first luncheon of the Jesse and Amanda Knight Society, established to honor those who, like the Knight family, have helped secure the school’s future through deferred gifts (of any size): trusts, wills, investments, or life insurance that will mature in years to come. Often such philanthropy is not publicly recognized because it doesn’t bear fruit until the donor’s death; hence, the LDS Foundation, the fund-raising arm of the Church and BYU, created the society, not to solicit contributions, but to express gratitude. Part of the recognition challenge is just finding the donors. Often people set up deferred gifts without telling the university, and BYU doesn’t find out until the money arrives years later. The creation of the Jesse and Amanda Knight Society in mid-2003 has brought many such donors out of the woodwork, and the society’s numbers have grown by more than a third in recent months. A trust fund set up by the Knights has produced earnings for BYU semiannually for nearly 90 years. “More important, perhaps, even than Jesse Knight’s tremendous financial gifts to the university,” said President Samuelson at the luncheon, “was his perseverance and his forbearance and his confidence and his enthusiasm and his unfailing faith in the future of the university. “Every generation needs people like Alfred Kelly who receive and share inspiring vision. But every generation also needs people like Jesse and Amanda Knight who demonstrate faith and act on the vision to make it reality. Feedback: Send comments on this article to commentary@byu.edu.